The expressions “scrutinised” (l.7), “undertaking” (l.15) and “comply with” (l.21) can be respectively replaced by probed, setting about and conform to without this harming the text’s coherence and meaning. In the excerpt “it takes place before an action is carried out” (l. 38 and 39), the pronoun “it” refers to “anticipatory tool” (l.38). Judge the following items concerning the facts and ideas presented in the text. The work of an environmental auditor is stopping procedures which do not conform to standards and regulations, an aim which he tries to reach by preparing reproachful reports based on facts and data. 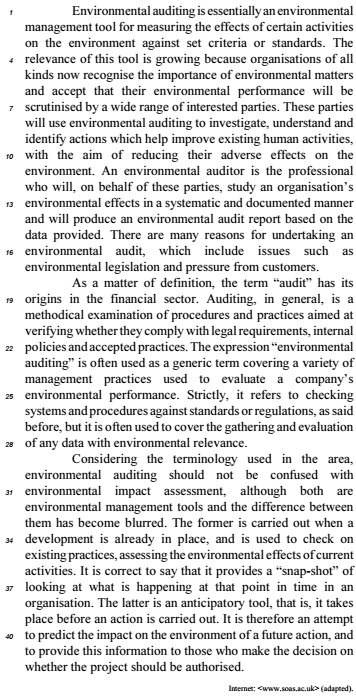 The difference between environmental auditing and environmental impact assessment is nowadays clear for those who work with auditing, be it in the financial field or in the environmental one. The product of an environmental audit is a description of an organisation’s relationship with the environment which should not be taken as definitive and ultimate as the data analysed is particular to a specific point in time.